Many of my friends know that I have an interesting relationship with Marvel films. Though I eat them up like a rabid animal and see everyone one in theaters, I don’t always enjoy them; often times I feel kind of burnt out, like I’ve seen it all before. This, unfortunately, has led my to look at Marvel films with a far more critical eye than most other geek-media. When the first Infinity War trailer was released, I found myself unexcited, with no idea why. I felt as if Marvel had finally exited my system, and I couldn’t be my full self anymore. Then along came Black Panther. Going in, I had high hopes, but was ready to be let down as my mind is wont to do. Needless to say, I’ve now seen this film three times in theaters. Black Panther truly blew me away. With its rich mythology and poignant subject matter, Black Panther captured my imagination like no recent Marvel flick has, for so many different reasons. Black Panther follows T’Challa after the events of Captain America: Civil War. He has returned home to Wakanda to take the throne, and unbeknownst to him, the political strife that would follow. Erik Killmonger, the villain of the film, is coming to Wakanda, aiming for the throne. The movie weaves several conflicts throughout, and the result is a wonderful bit of fresh world-building that the MCU desperately needed. The cast of this film was absolutely superb. Chadwick Boseman brings a strong yet naive nature to T’Challa, returning home to take on a role he doesn’t really feel quite ready for. Danai Gurira and Lupita Nyong’o work their characters excellently (Okoye, the leader of the royal guard, and Nakia, a spy and T’Challa’s close ally, respectively), bringing more depth to the world of Wakanda. Andy Serkis was great once again as Ulysses Klaue, but the true standout (to me and most of the Internet) was Michael B. Jordan’s Killmonger. He brought an air of righteousness and terror to a Marvel villain that hasn’t been present in recent films. What really stood out to me about this film was the production design. Each costume, set piece, and prop evoked a wonderful Afro-futurist mix of sci-fi and tribal Africa. The costumes were wonderful and vibrant, the props gave a sense of the world and, though the visual effects weren’t always the cleanest, the Wakandan city-scape was incredibly beautiful. After leaving the theater the first time, I had some issues with some of the character development throughout the film. However, after some deliberation, I realized that some weak characterization was expected, as the main character of this film wasn’t really T’Challa, but the nation of Wakanda itself. 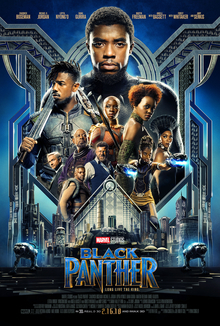 As I’ve said before, the world-building is where this movie really shines, and the country of Wakanda is fleshed out with history, mythology, and wonder. It truly did inject some much needed life into an MCU I was starting to burn out on. If you were debating whether or not to see this film, do it. It is a refreshing new entry in the MCU and, while not the best Marvel has done, definitely ranks among the top. This film provides perspective, representation, beauty, and so much more. I’m once again excited for the future of the MCU. Thanks for reading, folks. Next week, I think I’m gonna talk about some toys! Stay tuned.